Greg Ward is an up-and-coming alto saxophonist; this is his second album as a leader, though he’s played and recorded with a bunch of people over the last few years. (Buy it from Amazon.) The CD came out back in October, but I’ve been thinking about it, and periodically dipping into it, since getting it in the mail in about August. It doesn’t sound like any other jazz disc I’ve heard this year. Ward is a uniquely obsessive player, worrying away at phrases with a crying, humanist tone, and you might expect the rhythm section backing a musician like that to act with exaggerated sensitivity, swaying slowly around him as though not wanting to shock him or hurt his feelings. But instead, bassist Joe Sanders and drummer Damion Reid are one of the most forceful teams around. Reid in particular is a real force, hammering the beat home and giving the music an assertiveness reminiscent of players who worked to blur the line between jazz and rock, like Ronald Shannon Jackson and Al Foster. He’s more concerned with staying in jazz territory than either of those guys, but the aggressiveness he displays on tracks like “Velvet Lounge Shut-In” and the album’s title track is genuinely shocking at times. Sanders has a terrific tone, sort of operating in the middle of the bass’s range with a real fullness and vibrancy, but he doesn’t make a big show of himself, really; he’s aware that Ward’s in charge and Reid’s gonna try to seize as much territory for himself as possible, so he just positions himself between the two of them and maintains a balance that ultimately winds up doing as much to create the group’s identity as anything else. Everything I’ve said above applies to six of Phonic Juggernaut‘s seven compositions. The last track on the album, “Sectionate City,” is totally different, heavily processed, with Ward’s saxophone running through pedals and the drums staticky and clattering in an almost drum ‘n’ bass manner, and the bass both bowed and altered to sound more like a harmonium. It’s a droning ballad with double-time yet still somehow almost ambient drums beneath, and when synths begin to surge in, filling the sound-field with whooshes and hums, it all starts to remind me of a cross between recent Radiohead and, say, Briggan Krauss‘s Descending to End, an album composed of layer upon layer of digitally altered saxophone. 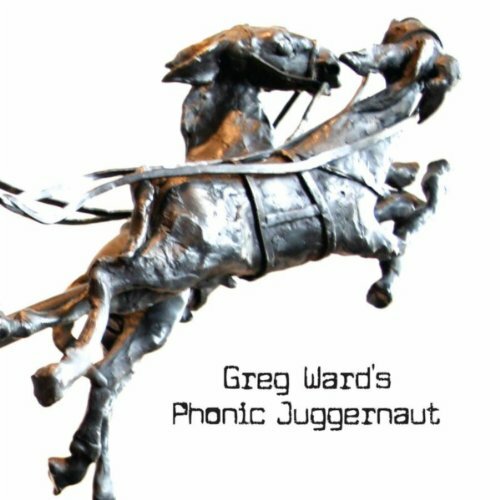 Greg Ward is clearly a musician with focus and vision, and Phonic Juggernaut is a powerful statement that makes me want to hear more of his music, particularly with these compatriots, ASAP. One of the best jazz albums of 2011.